We love the elegant style of this porcelain table lamp! 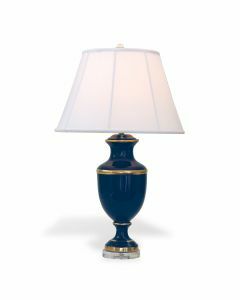 Available in 3 sizes, this lamp works in bedrooms, foyers, and living rooms alike. The small measures 12 x 12 x 20, the medium measures 15 x 15 x 26.5, and the large measures 18 x 18 x 30. Please select size from drop-down menu below. Please note this item is custom made to order and cannot be returned. The lead time is approximately 4-6 weeks. Click on image for greater detail.